MINEOLA, N.Y. (March 16, 2015) – Acting Nassau County District Attorney Madeline Singas was joined by Nassau County Police Commissioner Thomas Krumpter and legal associations representing various ethnic communities on Long Island today to announce a new initiative designed to reduce crime for all Nassau County residents by seeking to enhance communication and cooperation between law enforcement and the County’s substantial immigrant and ethnic populations. 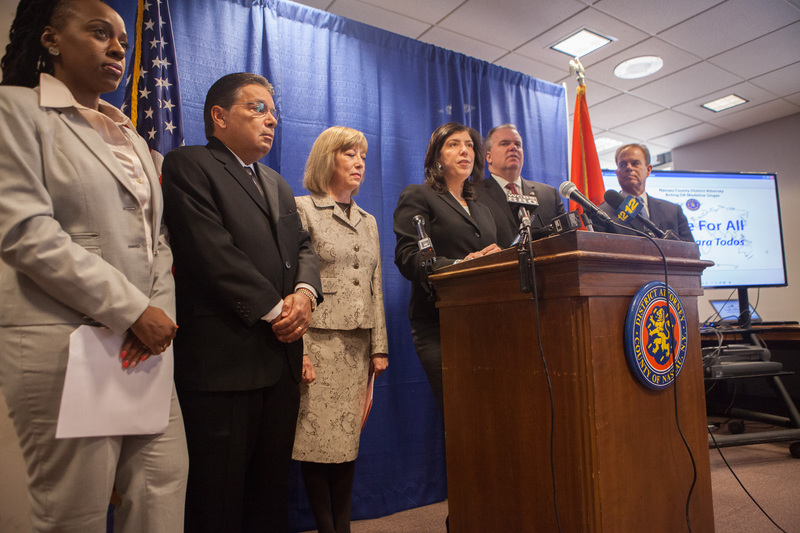 Acting DA Singas has assigned an assistant district attorney to head a new initiative in her office to: (1) to investigate and prosecute those crimes targeted specifically against immigrants; (2) to encourage the immigrant and New American populations of Nassau County to cooperate with law enforcement when they are the victims or witnesses to crimes of any kind; and 3) make referrals to appropriate agencies as needed. It is understood in the prosecution and law enforcement communities that) immigrants are often targeted to be the victims of gangs, fraudulent professionals, unscrupulous employers and landlords, those falsely claiming to be able to expedite immigration applications, and violent criminals. Immigrants are also often less likely to cooperate with law enforcement when they are the witnesses to crimes. This is often due to obstacles for victims and witnesses like language proficiency, elevated levels of trust between members of the same immigrant group leading to exploitation, documentation status, or general unfamiliarity with or mistrust of law enforcement. Assistant District Attorney Silvia Pastor Finkelstein, a Madrid-born career prosecutor who speaks Spanish and French, will coordinate the initiative as the director of the office’s new Immigrant Fraud Investigations program. Languages spoken by Nassau DA Assistant District Attorneys, investigators and other staff include: Spanish, French, Korean, Japanese, Greek, Italian, Polish, German, Russian, Belarusian, Hebrew and Bengali. Translators are available for other languages. ADA Pastor Finkelstein has already started engaging in outreach efforts to ethnic and immigrant communities in Nassau County to apprise them of the new initiative and its goals. By opening lines of communication and trust she will connect immigrant victims of crime and witnesses with appropriate bureaus within the District Attorney’s office and other law enforcement agencies. The Immigrant Fraud Investigations office will also investigate and prosecute cases involving financial frauds against immigrants and other ethnic residents of Nassau County. Numerous cases in the Nassau County District Attorney’s Office’s various bureaus – including Vehicular Crimes; Street Narcotics & Gangs; Organized Crime & Rackets; Economic Crimes; Government & Consumer Frauds; Special Victims; County Court Trial; and Major Offense; have relied heavily or entirely upon immigrant witnesses. The office has also prosecuted many cases in which immigrants were victimized specifically because of language barriers, known documentation status or elevated levels of trust between members of the same immigrant group. In the recent successful prosecution of a fraudulent modeling agency called New Faces, approximately 90 percent of the victims were immigrants or New Americans, and 60 percent of those were Spanish-speaking. Prosecutors believe the victims were targeted not due to any known immigration status, but due to their perceived ethnic affiliation and an expectation that they would trust a fellow immigrant, not understand complex English language contracts, and feel too much apprehension, shame or fear to seek help from authorities after being scammed. Approximately three quarters of cases in the office’s Labor Unit, which prosecutes wage violations against workers, among other crimes, involve immigrant victims. According to the U.S. Census Bureau, approximately 20 percent of Nassau County residents are foreign-born: six percent from Latin America, six percent from Asia, four percent from the Caribbean, and four percent from Europe. Approximately 12 percent of Nassau County residents are foreign-born U.S. citizens. Among all Nassau County residents, approximately 16 percent identify as Hispanic or Latino, while 12 percent identify as Black or African American and nine percent identify as Asian. Approximately 28 percent of Nassau County residents speak a language other than English at home. Among foreign-born Nassau County residents, approximately 81 percent speak English “Well or Better,” and 19 percent speak English “Less Than Well.” The population of Nassau County is approximately 1.4 million.